The planet is expected to exceed 9 billion people by 2050 and a growing middle class around the world is spending more of its disposable income on beef. With that, beef producers are enjoying record-high prices for their beef and with the rise in global demand for beef, the opportunities are endless for ranchers. However, this opportunity doesn't come without concern. "I hope retail prices do not become so elevated that beef becomes a rich man's delicacy, like lobster," said Tim Pazour, of Pazour Family Feeders in Pukwana, S.D. While some cattlemen worry only about what's happening at their point of the beef production chain, Pazour keeps a close eye on industry trends from pasture to plate. And what's happening at the meat case is just as important as the daily operations of his feedlot. "In the future, I worry about keeping enough consumer demand when plentiful beef supply returns after herd expansion," he said. A unique set of circumstances and a rare opportunity brought Tim back home to Pukwana and into production agriculture. After he graduated from South Dakota State University in 1978, he was offered an engineering job from John Deere. While most would jump at the chance for a "dream job" out of college, Pazour also had to consider another offer from a relative, who needed help on his diversified operation. He decided to pass on the engineering job and head back west to help custom combine, cut silage, drive truck and feed livestock. He never expected to be placed into complete management so early, but the sudden death of his mentor from a massive heart attack in 1986 placed him in the position to take on the operation himself. Pazour and his wife Karla run Pazour Family Feeders with son Jim and his wife Crystal, and son Joel and his wife Bradee. Tim's brother Mark is in charge of crop production and mechanical maintenance. When both sons indicated that they wanted to come home after college, the Pazours worked to expand the operation. The 5,000-head permitted feedlot was completed in 2006. "The farm and ranch operation, like our marriage of 35 years, is a work in progress," said Karla. "Our sons provided a lot of the sweat labor, building pens and putting in water tanks." Adapting to change has been key in maintaining a successful operation that has lasted through the decades and supports multiple generations. "We've always fed cattle but when environmental issues arose, we were forced to make changes," said Karla. "At that point, we decided to completely relocate and design the current feedlot. It sits on approximately 100 acres that previously was crop ground. Runoff is captured in a 7-acre pond that is later pumped through an irrigation system that waters approximately 110 acres of cropland when moisture is needed." Pazours purchase most of their feeder calves from western South Dakota privately and through local auction markets. 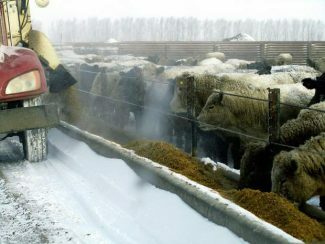 Cattle are fed a ration of mostly rolled corn with ethanol by-products, hay and silage. "We feed mostly Angus-based calves, but I love our Charolais crossbreds, too," said Tim. "We like buying front-end steer calves in the early fall and feeding them hard, aiming for the spring and early summer fat cattle market." The Pazours sell most of their finished cattle to JBS, with trucks delivering to Grand Island, Neb. They strive to get cattle to harvest prior to the summer heat, typically selling at 1,200-1,400 lbs. in May and June. "If we have feed and corn available, we like to feed yearlings purchased in August and September to finish in February weighing 1,500-1,600 lbs." said Tim. Tim and Karla agree that South Dakota cattlemen produce some of the finest quality beef in the world, and central South Dakota offers one of the best places in the country to feed the cattle. "The weather is fairly conducive, feed supplies are plentiful, and corn basis is well below other feeding areas," said Tim. "There are great opportunities for young people to be in this business, but they better be willing to work." "An understanding spouse and family are critical in agriculture," added Karla. "Cattle need feeding seven days a week, feed trucks can break down on the weekend and, it is very rare when all of us can be gone at the same time. I appreciate my daughters-in-law greatly because they understand the commitment needed to be part of this complex operation." Both daughters-in-law drive 20 miles into Chamberlain to work each day, where Crystal is a nurse and Bradee is a financial advisor. The Pazours have three grandchildren, including Jim and Crystal's children, Jennings, age two, and Baylor, three months; and Joel and Bradee's son Ladd, one year. Their daughter Jennifer and her husband Luke Neubert work as engineers in Orlando, Fla.
Outside of the feedlot, Karla keeps busy promoting the beef she loves. A member and past president of the South Dakota CattleWomen, she now serves as the South Dakota Beef Industry Council president. She is also a National Cattlemen's Beef Association Federation of State Beef Councils director representing South Dakota and serves on the Convenience subcommittee. Through these leadership roles, she helps influence the way Beef Checkoff dollars are spent and works to use these dollars wisely to promote beef, boost demand and meet the needs of today's consumers. "I recognize the need to reach the millennial-age market and continue to improve the ease of cooking," Karla said. "While our industry is making great strides in overseas markets, we must always put emphasis on the consuming base here in the U.S."
Through her work with the South Dakota CattleWomen, Karla has kept her boots on the ground in promoting beef and has interacted with consumers during the Ellsworth Airforce Base picnic, the South Dakota Beef Ambassador Program, and the South Dakota Beef Cook-Off, just to name a few. 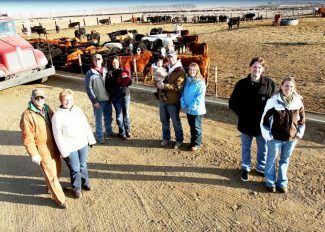 Pazour Family Feeders is truly a family-owned farm and feedlot, and Tim and Karla hope to pass their passion for the beef industry onto the next generation.